Should you wear Polarized Lenses for golf? Yes. Yes, you should. But only if you like them. A polarized lens is a lens with an embedded filter that blocks light that comes through specifically on the horizontal axis. This light is what we recognize as glare. For the wearer, this means that a polarized lens blocks glare reflected off various surfaces and it makes for a more pleasant, sharper optical experience, and creates an experience at which your eye can perform at its best level. How is it a Polarized lenses different from a standard, tinted lens? You can quantify the benefits of a polarized lens vs non-polarized lens with light meters that read the amounts of light that are filtered by the lens, and it helps to understand that while non-polarized lenses filter all light, on both the horizontal and vertical planes, meaning it generally diminishes the light that reaches your eye which can serve to mute your overall visual acuity. A polarized lens lets the useful, vertical light pass through the lens and only blocks the distracting, hindering horizontal light. More simply, you can qualify the difference between the two lenses by wearing a polarized lens on and noticing how it feels. 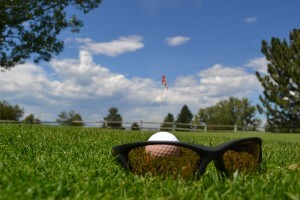 After spending a few hours on the golf course, a polarized lens will let you finish your round with fresher eyes that are less fatigued from squinting through glare. They will give you a clearer view of the course, of the ball as it leaves the tee and of whatever else you look at while you’re golfing. Personally, I notice that after I’ve hit my ball I can find it at a distance more easily because of the way the polarized lens reduces the sheen that bounces off the grass, letting the ball stand out in greater relief. It’s not just about the ball, though, and simply put, a polarized lens makes for a better perspective. They come in a lot of different tones and colors, and the best color is the one in which you feel most comfortable. – Some people feel that a polarized lens distorts your ability to read the green, and the best explanation I’ve heard for this has been the way the sheen off the grass betrays the green surface and the read of the putt. That’s fine, and I think it makes sense. Glasses aren’t glued to your face. – I’ve heard that polarized lenses can feel “distorting”. Again, if that’s your experience, it’s too bad. First, I’d probably say that not all polarized lenses are created equally. Materials and quality matter, you get what you pay for, etc. I’m sure inferior lenses can feel distorting, and they can probably lead to headaches as well. There are some people who have true sensitivity to polarized lenses, as well as certain lens materials, but more often than not there’s an error or quality issue in the lens. – A polarized lens isn’t necessarily right for you. The same way your driver and your shoes aren’t necessarily the very best options for me, a sunglass lens is an individual choice and largely a matter of personal preference. If you don’t like them, don’t wear them. But if you haven’t tried them you should, because they can be quite nice. Ask yourself when you play. What time of day and in which light conditions? What do you currently wear, and do you find yourself squinting against brightness or struggling to let light find your eyes? Besides golf, where will you be using these? If you have questions about polarized lenses or which style lens is right for you, ask an expert. Call us or write us. Single Vision, Lined Bifocal, or Progressive? We specialize in prescription lenses, and while we’re glad to offer dozens of lens options and combinations, our choices can also be overwhelming. Rather than speak optical gibberish at you until you’re disoriented enough to either open up your wallet or hang up the phone, I”d like to make an effort to explain some of this stuff. Today, we’ll learn how to answer the question: What focal style lens would you like? Single-vision lenses are lenses that have one, static focal strength throughout the lens. If you can’t see the pin without your glasses, but can still read your scorecard, then you need single-vision lenses for distance. Lined Bifocals and Progressive Bifocals are for golfers who may or may not be able to see distance clearly, but who need help seeing up close. In a Lined Bifocal the majority of the lens has a focal strength that accommodates distance vision. Some people require no correction, meaning the majority of the lens has a very minimal correction. Other people require strong distance correction. In either case, the Bifocal component of the lens is a distinct section, marked by a flat, visible line across the lens, which is the area of the lens that has a fixed focal power tuned specifically for near vision. A Progressive Bifocal operates under the same premise, with the upper, majority of the lens having your distance vision and the lower portion focused on your near vision. However, the unique aspect of the Progressive Bifocal is that instead of a flat, visible line, there is a graduated progression of a focal change. This graduation typically begins around the bottom of your lower eyelid and progresses towards the bottom of the lens. While the Lined Bifocal has a single, fixed focal power, the Progressive Bifocal has a range of focus that increases in strength, so that as your eye moves downward it can find increasingly strong focal sections of the lens, enabling you to use one set of lenses for a variety of focal distances. In practice, this means that in a progressive lens you can look through the upper portion of the lens to follow your drive, you can look through the middle to see the ball at your feet, and look through the bottom of the lens to open your beer. There isn’t a right lens for everyone. It’s simply a combination of what type of lens you require and what type of lens you feel most comfortable using.